Skype for Business is available as upgrade for Lync client. Upgrade is available from 15th of April as KB2889923. Knowing which KB is bring this change, System Administrators or responsible persons for updates will be able to control will this update will be applied or not. This will give most of companies time to adopt and test new functionalities of Skype for Business. Script is simple and code will be shown here, but at the bottom of this post you can find download link so you don’t need to type script. 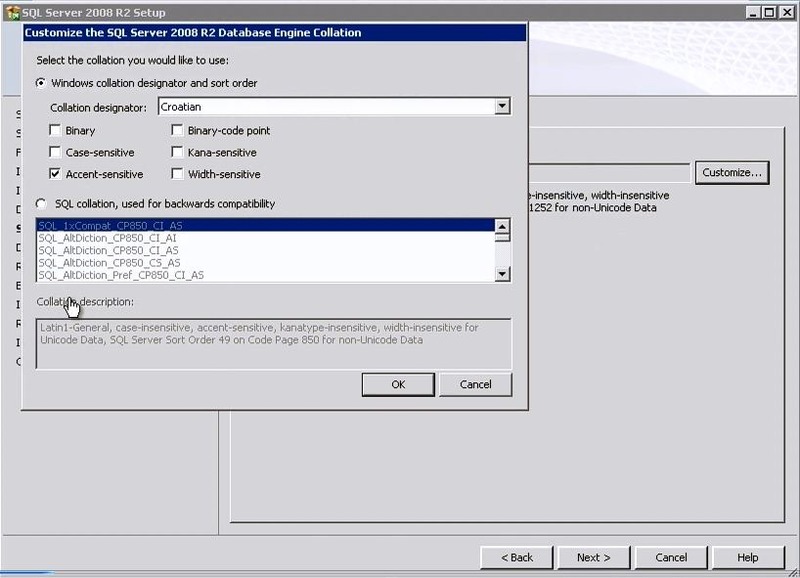 From SCCM 2012 RC to SCCM 2012 SP1 in few steps. I finally upgrade my System Center Configuration Manager form RC version to RTM version with SP1 included. As I had “small” collation problem I couldn’t just simply reinstall it. For that reason I was uninstall my SCCM completely. Plan was to keep server name in Active Directory and to keep same site name. In that reinstallation I was separate my SQL server from my SCCM server. 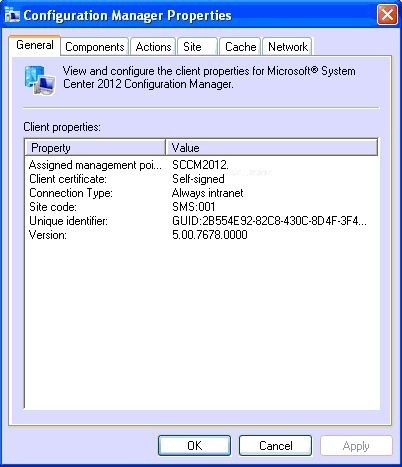 Now I have SQL 2012 SP1 for all (future)System Center products, and SCCM is connected to it. After one working day my job was done and I have fully functional SCCM. Now I have to wait for clients to contact SCCM. Most of clients were contact SCCM in next two days, but some clients don’t. Then I use some old stuff which can be found on Niall Brady forum. As I’m very lazy , and I don’t want to type all over again You can find solution for deploying/redeploying clients here. Windows Intune offers unified solution for managing your laptop, PC and different mobile devices. Before few weeks I receive excellent book about System Center Configuration Manager 2012. 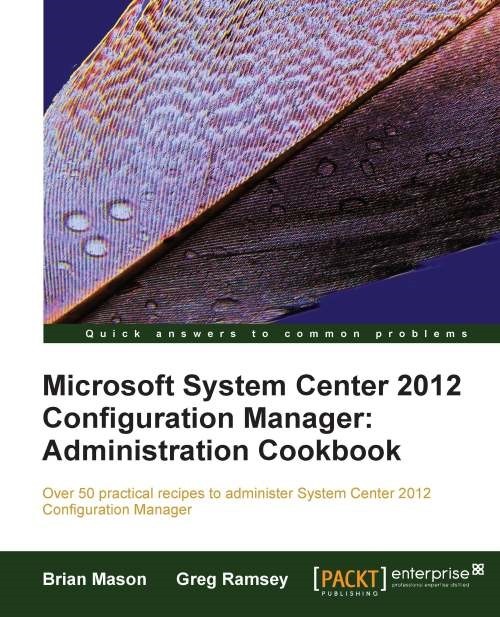 Name of the book is: Microsoft System Center 2012Configuration Manager Administrator Cookbook. It’s written by two MVPs, Brian Manson and Greg Ramsey, and reviewed by two another MVPs Torsten Meringer and Kim Oppalfens. The more I read, I more understand complexity of System Center Configuration Manager, and tips and tricks about fine tuning. One of basic things is how to deal with SQL server. If you set up your SQL in wrong way, you will face problems lately. SQL can slow your Configuration Manager performance to almost unusable. But in the book you can find advices how to avoid this to happen. 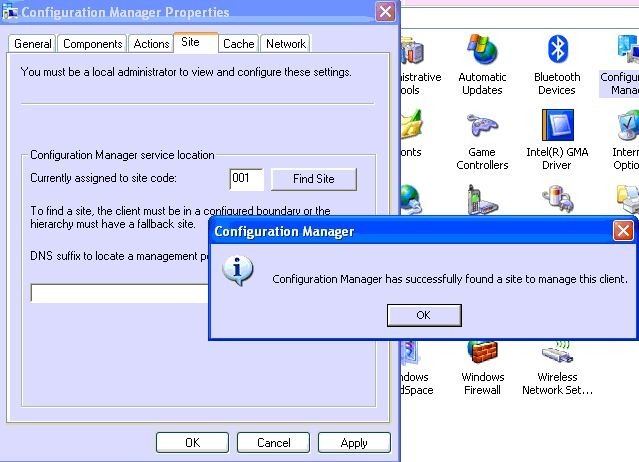 System Center Configuration Manager is probably the most complex and feature rich product in the System Center suite. For managing all features you will need knowledge about IIS, SQL, WSUS, WMI, PXE, SSRS, operating systems and networking (and much more which I forgot probably). So I found this book very usable in every day working with Configuration Manger 2012 (CM12 as called in book). Microsoft System Center 2012Configuration Manager Administrator Cookbook also can be very good for total beginners (administrators starting with System Center 2012). In book you can find practical advices and solutions how to continue when you are stuck, or how to do something from scratch (and avoid problems). Generally I’m very satisfy with my copy of Microsoft System Center 2012Configuration Manager Administrator Cookbook, and I’m using it every day on my job. For checking my previous configuration of my System Center 2012 and when I plan to implement new feature to see how to do it. What is SQL collation? SQL collation refers to a set of rules that determine how data is sorted and compared. Character data is sorted using rules that define the correct character sequence, with options for specifying case-sensitivity, accent marks, kana character types and character width. SQL collation knows to be pretty annoying thing, especially if you chose wrong one. I find out that on hard way. After I was install SCCM 2012 RC and I was try to „upgrade“ to RC2. Where is the catch? Catch is when you going to install SQL server, by default it picks up collation from regional settings (in my case Croatian). You can change collation during installation but if you are not careful enough you could face with serious problem (like me). Why? Because RC will work fine but upgrade to RTM will be almost impossible. 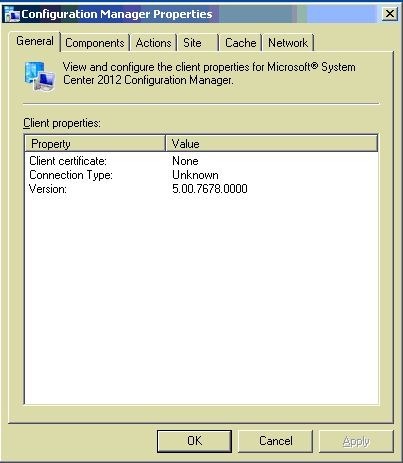 Microsoft supports upgrade System Center 2012 products from RC to RTM. RTM (or RC2) will asks for SQL_Latin1_General_CP1_CI_AS collation on your SQL. Now you have problem if you pick wrong collation before or you didn’t pick it at all (you have default created on regional settings bases). Only way to resolve the problem is to uninstall SQL and install it again with correct collation. 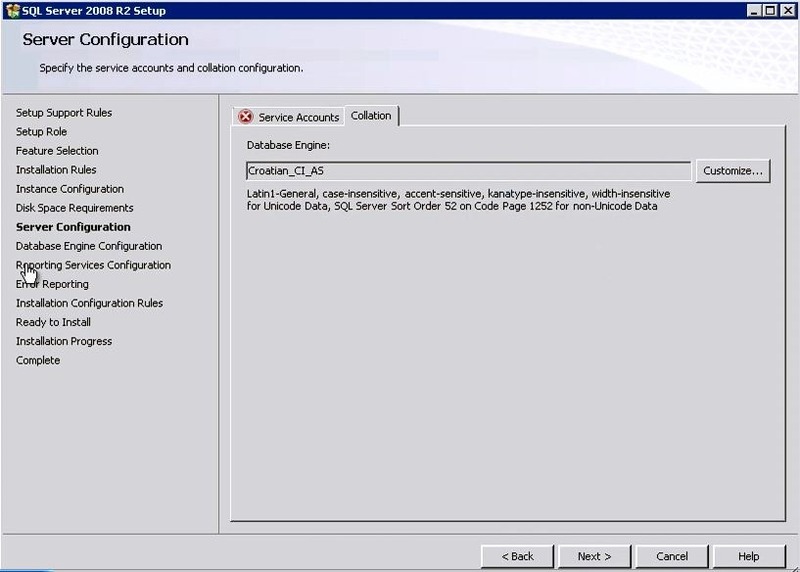 But if you are using existing SQL you need to (can) change collation before installing SCCM 2012. And for last thing, you can’t change collation on existing CM_xxx database. Why? CM_xxx database is really complex, and collation change will fail. Colleague of mine Luka Gros tried but he didn’t make it. He received error every time. Conference time in April is over. I had two presentations this month. First one was at MS NetWork 2.0 in Mostar, Bosnia and Herzegovina. MS NetWork 2.0 presentation was about how to turn datacenter into private cloud solutions. Second one was at WinDays 12 in Rovinj, Croatia. This one is called SCCM 2012 Tips And Tricks. If you want to use SCCM 2012 as a software update point (SUP), you will have to install WSUS first. 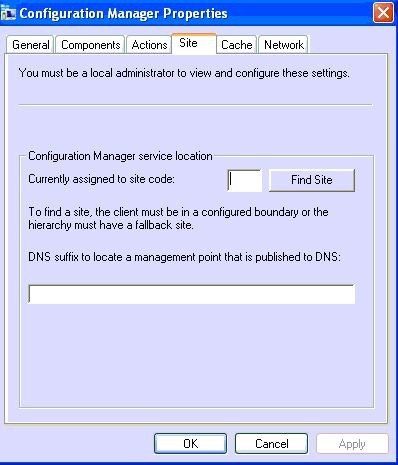 On Windows Server 2008 R2 installation of WSUS is integrated as a server role. You don’t need to download installer separately. Catch is that you will need to use SCCM server database. But if you install WSUS first You will probably install its own database. But if you are install your SCCM as I do, then you will have a problem. After this my only option was to uninstall WSUS, and install it back again with correct parameters. Uninstall was completed successfully. But on installation I was faced with error. Error was “the update could not be found there may be a network connection issue”. This error is caused by setting in GPO of SCCM server. To resolve this You must point to gpedit.msc and then go to Computer Configuration – Administrative Templates – Windows Components – Windows Update. Put “Automatic Updates” and “Specify Intranet Microsoft update service location” to “not configured”. Important thing is that you have proxy settings configured in your correctly web browser . After this I was able to continue with installation without error. Why is this update option important? WSUS using Dynamic Installer to download all needed content for installation from Microsoft websites. Wrong thinking is that WSUS binaries is on server or on CD. I don’t know why this error occurred but, this is steps for resolving problem. 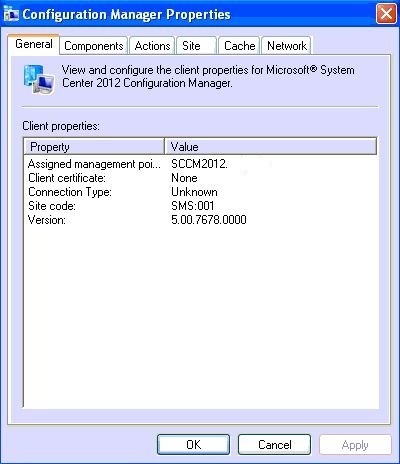 Your client is now visible in your SCCM console and you can manage it. If You want to implement Dot.NET framework 4.0 using SCCM 2012 you have whole workaround on MSDN site. But something can go wrong. Where is catch? 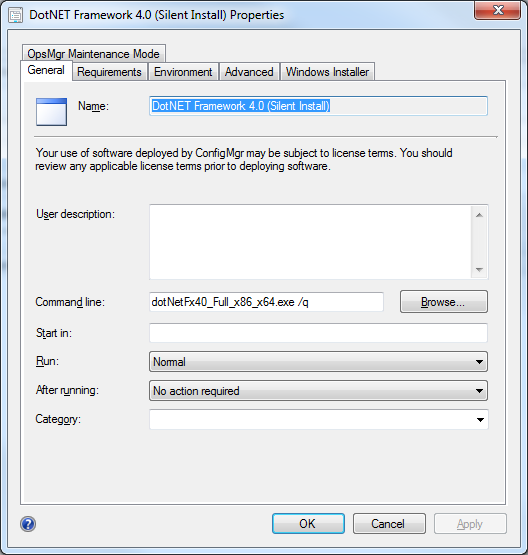 First of all you must create package in SCCM 2012. When you creating package for deployment, you will be prompted to create a program. During program creation You are asked for command line . Of course You want to install Dot.NET framework without user interference. So switches is needed. But installation ended up with error. Trying to troubleshoot is not giving any result. and after that deployment ended successfully.